The steam drum allows to obtain a product of excellent quality on any of our products, it takes away some of the fusel oil, so they do not get into the product. The steam drum also protects against the ingress of foam and drops of raw material into the distiller. Copper is a classic metal in the cognac and other industries. During distillation, copper saturates the drink with ions, due to which the aging in oak barrels is accelerated, so the taste of the drink is fully revealed. Due to the abundant composition of copper, alcohol-containing vapors are saturated with a special taste and, according to many distillers, there is a special "refinement" and improvement of the drink. 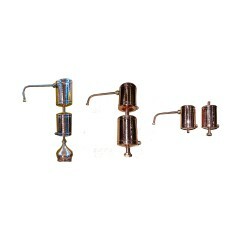 Throughout the world, copper coils are most often used. The product is easy to attach to all our products, it is compact and convenient to use. If you already have our product, please tell us how many liters and we will do for you. Any combination is possible, contact us and we will do everything you need. 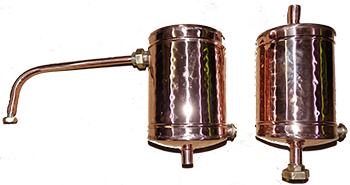 Alcohol Distiller Moonshine Thumper Copper Il y a 1 produit.